I love Carnegie Mellon and I will be the first to add that I love Pittsburgh as well. Coming from the suburbs of Washington, D.C., Pittsburgh has always felt like an improvement on home, being more walkable, having better restaurants (although nothing can compare to my mom’s cooking) and at the risk of stating the obvious, far better sports teams! But as much as I love Pittsburgh, I have always been the first to flee it when a semester ends. After my last final exam freshman year, my parents and I were back on 376 East before the contents of my dorm room had settled within our minivan. And my sophomore spring, I left Pittsburgh before the month of May thanks to a number of classes that required I either turn in a final essay or portfolio. It’s not that I have ever been running away from anything in Pittsburgh, but on the contrary, there just always seems to be opportunities created while on campus that quickly fling me out of the city. My freshman year that was the chance to study abroad for the first time, traveling to Frankfurt, Germany for a two-week program at the WHU Otto Beishmen School of Management and then back home for a summer internship with the Alexandria Economic Development Partnership. Last year the journey was even more unlikely. 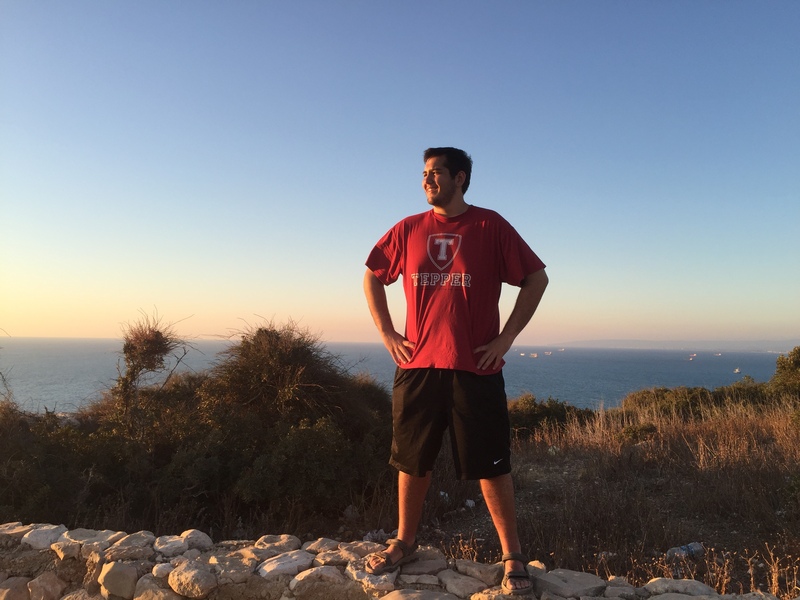 But with the support of the Buncher Entrepreneurship Award, I soon found myself 6,000 miles away from Pittsburgh, spending the summer in Haifa, Tel Aviv and Jerusalem while interning with an Israeli startup. And so it is with excitement but some trepidation that I linger on campus to start researching my senior honors thesis. This summer, I am in a familiar location and yet still completely immersed in the unknown, and no I’m not talking about how the Exchange closes at 2:00 p.m. or the U.C. Black Chairs are somehow now nearly always empty during the summer (although both are jarring and bittersweet). The nature of my research can partially explain these feelings. Under the advisement of Professor Jim Daniels (and with additional help from the Swartz Center for Entrepreneurship) I’ll be launching into a creative Inquiry into the Future of Work. Currently it’s a pretty broad topic filled with a lot of ambiguity and ambition. Since the initial proposal in late March, there have been changes to the way in which I plan on conducting my research and structuring my findings, as I iterate through various ideas. Reconciling my proposal to fit the requirements of both the Dietrich Honors Fellowship and the Innovation Scholars summer stipend was an exercise in itself. Maybe it’ll help clarify things if I define what I mean by a “creative” inquiry into the future of work. Due to my lack of credibility as a “futurist” (partially explained by my poor performance in March Madness Brackets) and the short shelf life of predictions about the future that are either too far forward that no one currently alive will ever be able to prove or disprove them or not far away enough to be interesting, I intend on creating an interactive documentary that covers my own journey and the stories of my peers to explore topics within entrepreneurship and creative destruction more generally. It may seem far-flung, but hey, I do have experience making documentaries (and in Cuba of all places!) and I have learned a lot from my experiences within the Swartz Center. So as I start my summer, grateful to have the support of the Dietrich Honors Fellowship and the Swartz Center for Entrepreneurship and unsure of where exactly my research will lead, I’m excited. It sure does seem like a great summer to be in Pittsburgh. I have been fortunate to be a part of a wide range of projects at Carnegie Mellon that have taken me across academic disciplines and international borders, from studying the European Union in Frankfurt, Germany to interning with a startup in Haifa, Israel and shooting a documentary in Camaguey, Cuba. Through my coursework in Pittsburgh, I have challenged myself to take on disparate ideas. From studying organizational behavior and modeling networks in Oliver Hahl’s Organizational Behavior to presenting on William H. Whyte’s “The Organization Man” and its influence on work culture in the 1960s in Kathy M. Newman’s “Mad Men, TV & Advertising,” studying business administration and creative writing has allowed me to combine the quantitative and qualitative while uncovering how interconnected the two really are. My current coursework takes me from a poetry workshop to a finance lecture and computer programming recitation, all in the same day. Combining these different approaches to problem solving and creative inquiry led me to join the third cohort of the Swartz Center for Entrepreneurship Innovation Scholars. The program provides resources, mentoring and funding for students who are passionate about innovation and entrepreneurship. Through the program, I traveled to San Francisco in January 2017 to meet with startups, accelerators and venture capital firms. The similarities and differences between the entrepreneurial ecosystems I have been able to be part of, from Haifa to Silicon Valley, continue to resonate with me and have been formative to my CMU experience.